Summer isn’t about the beach, wearing skimpy clothing or melting away in the sun. It’s about food festivals, and ending the long, hot months a few pounds heavier than when they started. In fact, I hate despise cannot even begin to tell you how much I dislike summer and the heat in general, and I hide in air-conditioned rooms as much as I possibly can. A plus side to being a restaurant owner is having large walk-in fridges and freezers to sit in (I’ve been known to sit on milk crates inside the heaven-sent steel rooms for long periods of time, waiting for the sun to go down and for the wretched LA heat to dissipate.). What could possibly make me count down the days til’ I sweat my buns off outside in the middle of July in LA?? 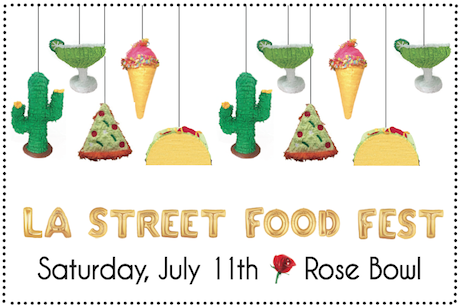 Enter the La Street Food Fest, going on this Saturday, July 11th, at the Rose Bowl in Pasadena. Yes, you can bet your sweet buns I’ll be waiting at the Bowl for the gates to open, and I will happily stuff my face with over 100 of the best LA vendors, all washed down with some pretty awesome booze options. MichieMobile– Get this: a VW bus AND Micheladas. That’s the fabulous concept behind the MichieMobile. Not only am I over-the-moon happy for my all-time favorite beverage, I’m also highly perturbed over the fact I didn’t come up with this idea. I also shared this with my sister (who will be attending this event with me), and she too looked at me with a stare of disgust that we never thought of such a brilliant idea. Michie, you’ve already become my favorite vendor. Don’t let me down. Monsieur Madame– Word is they’ll be offering foie gras sammiches for the first hour. They’re first on my list. After the Michie, of course. Pho Burger– Because. Burger + Pho. That’s all. Donut Friend– I have an unhealthy obsession for all things donuts. Nuff’ said. Good thing there’s an iced coffee and donut zone at the event, featuring a plethora of caffeinated beverages and sugary, heavenly delights (like brown butter glazed donuts from Steven Fretz!). Tickets aren’t sold at the door, so you HAVE to buy them online! The event is all ages, with a capacity of 5,000 people. In Laymen’s terms: don’t wait, or you’ll miss out on one of the most anticipated food events of the summer! For a list of all the participants, click here. 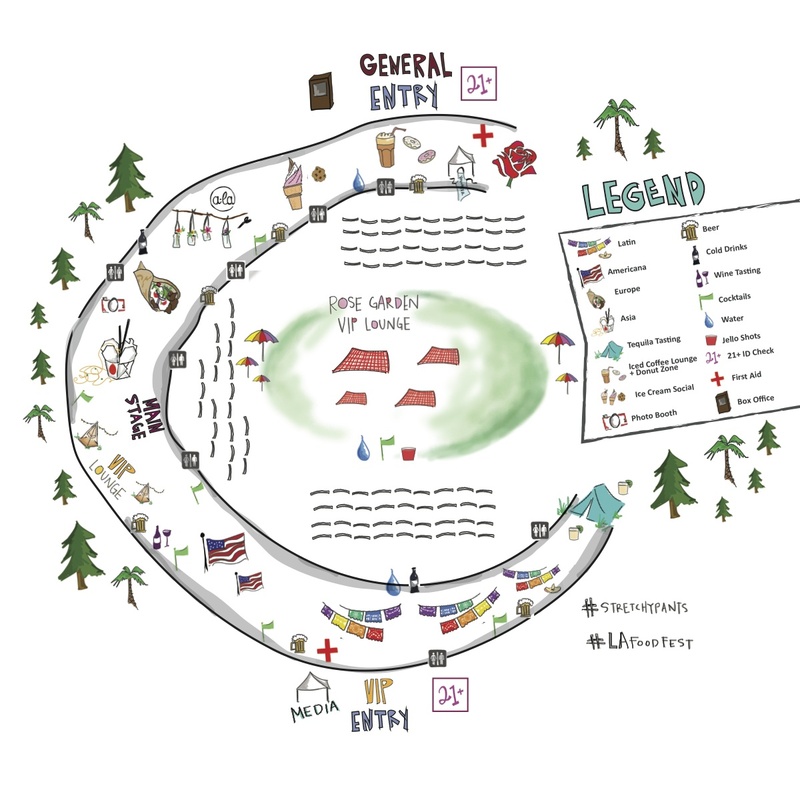 As with any festival, it’s always best to know where your favorite vendors will be located, seeing as many sell out before you can ever reach them. Here’s a handy map to help navigate with. Follow the hashtags #StretchyPants (because you’re encouraged to wear elastic-banded pants to the event! ), and #LAFoodFest for all the delicious photos from the day. Also, follow the event on Instagram, Facebook and Twitter. I’ll be live Tweeting and sharing on Instagram from the festival, so follow me for my view of the day! And if you’re heading to the festival, too, be sure to find me and say hi! The fabulous crew of the LA Street Food Festival invited me to attend this event. All opinions, like always, are my own.